We have extra and empty seats in District 299 because every CPS CEO from Arne Duncan on has added them. 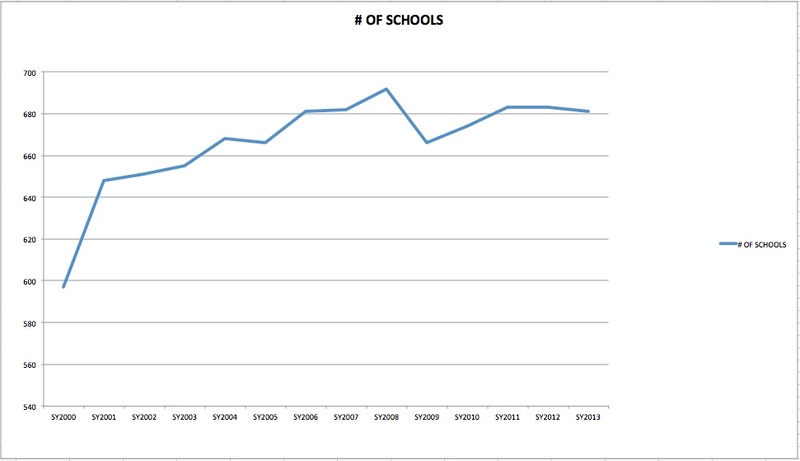 Even when CPS knew that CPS student enrollment has been declining since at least 1999. The whole concept of opening more schools in the District over a decade when CPS was aware that overall student enrollment was declining just didn’t make sense to me. So I began to dig around in the data and the records looking for something that might explain it. I stumbled across this report published in 2004 by the IFF, a lending and real estate consulting group for nonprofits in a number of Midwest cities including Chicago. “IFF was among the first community development financial institutions in the nation to provide below-market rate financing specifically for charter schools and has gained national recognition for its innovative use of U.S. Department of Education credit enhancement grants to finance charter school projects. Schools in certain markets can rely on IFF for help with the full spectrum of their real estate needs—IFF’s expertise ensures projects are well-planned, well-placed, and well-constructed. The creation of new schools is not advisable considering the level of underutilization in this community area. 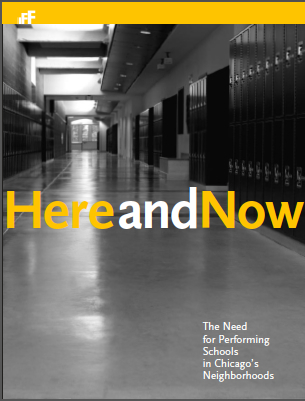 Existing low-performing schools that do not respond to improvement measures may be candidates for restructuring, particularly at the high school level. Further analysis should also be carried out to determine if the underutilized capacity in the current schools is or could be used in an alternative way to support academic improvement programs or programming for the community. Choice options exist in East Garfield Park, both as independent options (e.g., magnet schools) and as programs within neighborhood schools (e.g. Magnet Cluster programs). However, because of the low performance of many of the schools providing these options, the existing programs need to be evaluated before introducing new choice programs into the neighborhood schools. On the other hand, given the success of area charter schools, if a Level IV** school were to be closed and reopened, the community may want to consider reopening it as a charter school. **CPS used to have four levels of performance assessment for schools I-IV. Across the district, some schools were closed but many more schools were opened, and many of those are schools which restrict their enrollment in some way (selective enrollment, lottery, and applications) and/or which are privately run by charters and contracts. I’ve explained in the FAQ section of this blog, I’m not vehemently against the charter model as long as it meets some specific requirements for accountability, equity (access/pay) and transparency. But I am against submitting communities, families and students to constant volatility and change without being very transparent about what is going on or without giving the community input. I’m familiar with some of the names involved in the creation of this report. I don’t doubt that many of them had the best of intentions when they set out to create a strategy of improving schools under the assumption that charter, restrictive enrollment and contract schools would always perform better than district-run schools. In just as many cases as not, their assumptions were incorrect. …as vigorously as they had pursued closing and opening schools? We might not be in this situation that we are currently in.